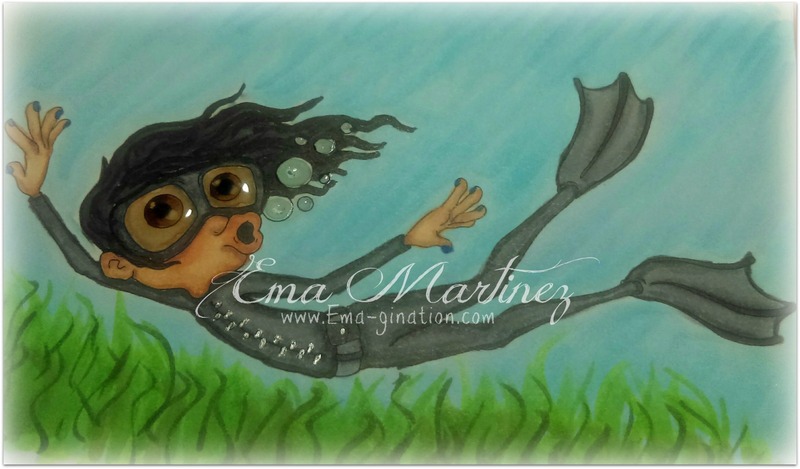 EMA-gination: Just Keep Swimmin', Swimmin', Swimmin! Hi all! 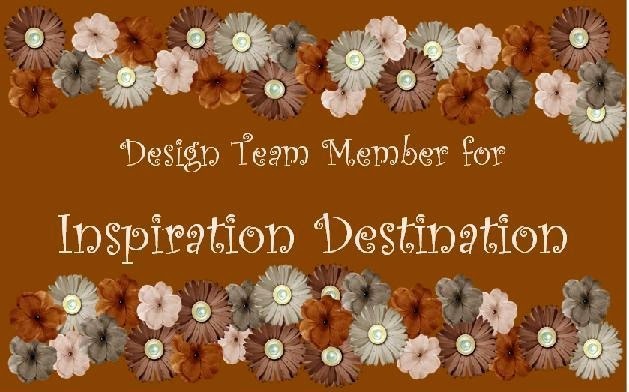 This is my DT project for My Time to Craft Challenge Blog. This week is Challenge No. 354 Under the Sea. I picked up this freebie from Bloobel last month for the progressive challenge. But of late, it has taken all I have to just color an image. So last month, I managed to color it and this month, I put it down to paper! Ugh! I cannot get caught up! I was wanting to join in on this month's Daily Marker 30 Day Challenge and all I've managed is to do Day 1! But you are not here to listen to me moan and groan. Let me tell you about my shaker card! Here's a close up of the image before I added all the hoopla! haha! So this is Swimming Diver from Bloobel Stamps. It goes really well with Angry Shark and Scaredy Crab. It was a discounted set back in July but I wasn't sure I could even color the one image so I didn't take advantage. I've colored the image with Copic markers, silver gel pen and Glossy Accents. 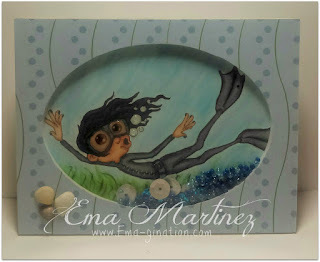 I used this tutorial for the underwater scene I found at Deborah's Shining Cards blog. It was my first time to try it and I think I should practice it some more! lol Pattern card stock is retired from Storytellers Club. Seashells are from my stash. The oval shaker card base is from Queen and Company. 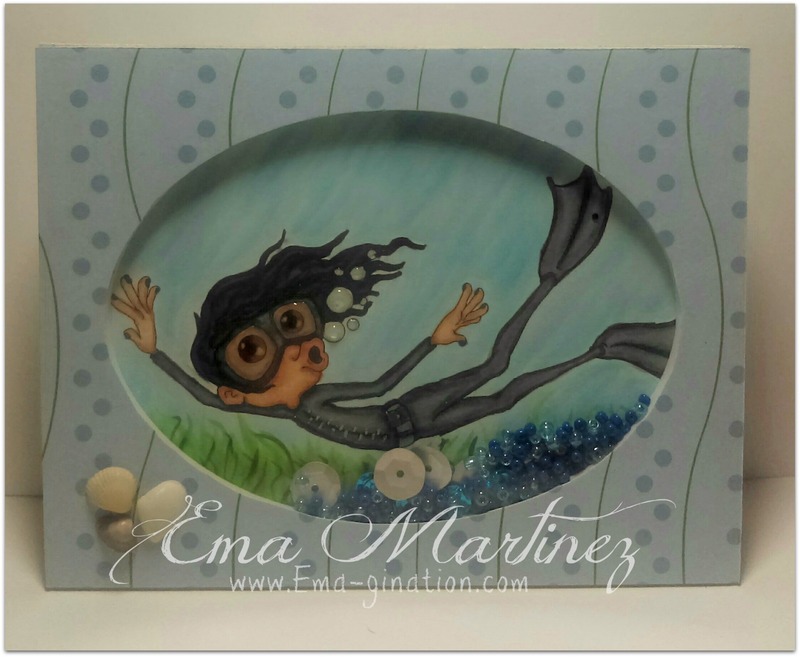 Such a cool diver - perfect for this clever shaker card. Fab colouring! Thanks for joining us this week at Just Add Ink. Oh wow, this is delightful Ema! Your underwater scene is fantastic and so detailed and I love your beautifully coloured diver too. Such a unique and clever way to add "D"! Thanks for sharing with us at Just Add Ink this week. Ema, this is so fun! I love the way you've colored up the image and your self made background is gorgeous and so perfect for the image. Thanks so much for playing along with us at Little Red Wagon Challenge this week! Ema this is such a fun shaker card. 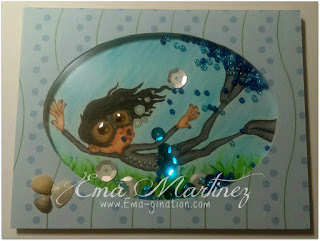 I love how all the sequins and beads act as bubbles for your underwater scene! Thanks for joining us at Just Add Ink this week.